We have marked a distinct position in the market by providing LDPE Shrink Film. We offer LDPE Shrink Film. 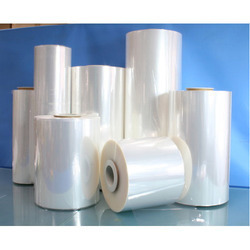 Being quality-centric firm, we are engaged in presenting a high-class range of PE Shrink Film Roll We assure our clientele the prompt delivery of these products at reasonable prices. - 8 Inch to 28 Inch Available With 7 Days Delivery. Rate Rs. 1680 Per Roll 8 Inch Each 1090 Meter Onwards. We provide our customers with shrink films, polyolefin shrink film that are ideal for bundling of automatic equipment. Puncture and tear resistant, our films are widely appreciated by the clients due to their durability, high tensile strength and reliability. YOGDEEP offer a wide range of PET Shrink Films which are used in food, cosmetics, chemical, paint and pharmaceutical industries for packing different products. Due to attractive look, these films are also used to enhance the appearance of product. We use high grade raw material to manufacture PET Shrink Films as per international quality standards.